In recent years, the rulers and political class of the Nigerian State have been totally drowned by the activities of the Indigenous People Of Biafra (IPOB), towards their quest to restore Biafra from the grips of the British government and the descendants of Uthman Danfodio. They are seeking for what they will hold on to and they ended up with a deceitful term called "restructuring". It is high time that people started to ask questions on why their political class are keen on restruturing even after it was killed and buried some months ago by Muhammadu Buhari, the ailing president of Nigeria. It is high time we started to ask "what is there to be restructured"? It is time for us to assimilate that restructuring is a continuous political process, and not a sincere means of addressing the deprivation of the minorities, marginalization of the vanquished and environmental pollution of the oil-rich region. It is time for us to look back to history to see the harm this deceitful restructuring has cost the enslaved Nigerians and Biafrans alike. In time past, Nigeria has passed through series of restructuring which can also be referred to as 'True Federalism', of which all became exercise in futility because the regions that made up the geographical space called Nigeria never believed in themselves, neither did they see themselves as one. In this era of trying to restructure what is never a nation, unitary system of government was as well introduced by the then military ruler which later still failed; before finally, the current federal system of government was adopted which Nigeria has been running till date. The political elites always advocate for restructuring whenever the people lament on the poor state of governance, because they wouldn't want to loose grip of their political business office. Having had a little glance at the phases of restructuring in Nigeria, the political rulers have once again started calling for restructuring of the country in order to still keep the masses under perpetual hope of a better country that never comes. In recent times, the clamour for restructuring has been on the lips of every politician because they are eager to retain their businesses without thinking or looking down to the feeling of the masses who have been clamoring for total desolution of the Nigerian State, which will pave way for speedy development both in the countries that will emerge from her and Africa at large. 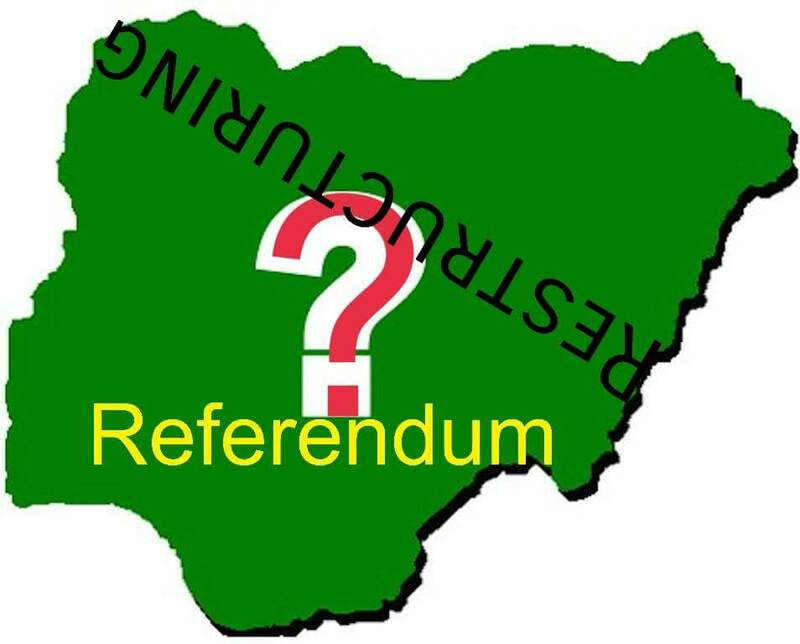 It is high time the people of Nigeria started reasoning deep to understand the hidden agenda behind the call for restructuring by all the political class so as to understand the reason why total dissolution of the Nigerian state is much more preferred than restructuring. The masses should trace the toes of IPOB and troop out en mass, work in tandem with IPOB, to destabilize the oppressive hands of these politicians that have vowed to keep Africa underdeveloped. Understanding that restructuring is a decisive terminology by the politicians will aid the youths to take up their future by their hands and truly work towards becoming the leaders of tomorrow which history has promised; but queuing behind the old and worn out politicians will continually keep us in total darkness. Therefore, to avoid these lunatic fringe that is geared towards the destruction of the future of the youths, we all have to rise up in unison and work with Nnamdi Kanu and his IPOB led group to emancipate ourselves from these usurious politicians that have marred the future of African youths. Now, more than ever, Biafrans around the world are determined to rule their own destiny; Biafrans have resolved to take their rightful position at the world stage. Biafrans are working assiduously to ensure that Biafra is restored in the shortest possible period of time under the leadership of Mazi Nnamdi Kanu and IPOB. We shall shun every antics of divide and rule imposed on us by the British government and upheld by the parasitic children of Uthman Danfodio. We shall not blink an eye, until Biafra is restored.